I had originally planned to write a post that contained an awesome recipe for meatballs. As I started writing I was overcome with memories and ended up with the post below. Don’t worry, my meatball recipe will be posted sooner or later. Note: I’m not about to get in to the argument over whether this is called “gravy”. We always called it “sauce”. I grew up in a typical New York, Italian family. My father came from Brooklyn. My mother came from the Bronx where she lived on the same block (and in some cases the same building) as her cousins. The family was close and it meant everything. When my mother’s family moved to Long Island in the 60’s they ended up living in a house that was a very literal stone’s throw from her grandparents, aunts, and uncles. When I came along in the 70’s, I looked up to my grandparents (both pairs- maternal and paternal). I was very close with them, and they were a huge part of my life and who I am today. Sunday dinner at grandma’s house was just something that you did. There was no special occasion needed (although when it was a special occasion, you ate like royalty). On Sunday afternoons, usually after 1:00 mass, we headed over to grandma’s. 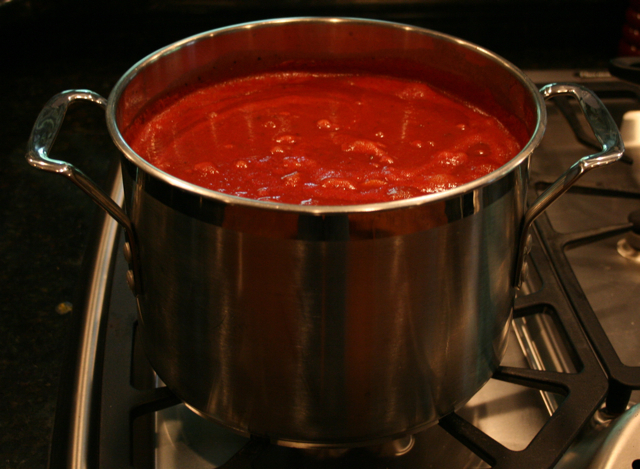 As you pulled in to the driveway on a spring day, when the windows were open, you could smell the sauce on the stove. Grandpa was the cook on Sundays. He made the meatballs (an oil burner repair man during the week, I always remember jokes about the secret ingredient of the meatballs was the oil under his fingernails). He made the tomato sauce that had various types of meat slow cooking and contributing to the flavor. To this day, whenever I make a meat sauce, the smell brings me visions of him working in the kitchen in a white t-shirt that may or may not have splatters of red sauce on it. Sauce is cathartic. It is what I consider comfort food in the truest definition. It seems like whenever there was a family tragedy, a meat sauce was made. I remember one day in September of 2001, my brothers and sister all headed out to my parent’s house on Long Island to see my father, who had worked in the World Trade Center pretty much since the day it was built. He had made it out in time, but lost a lot there. He had been working non-stop in the days following the attacks and this was the first time we were all together. There really wasn’t much we could say to one another. I remember just enjoying the fact that I was with my family around the dining room table. Then, my brother Frankie got up, went to the stove, and began to make a sauce. None of us thought it was odd. It made perfect sense at the time. When I spoke to my father about this recently, he commented “there had to be about a dozen of us at the impromptu gathering at our house. Frankie pulled out a pot that probably would have made a sauce for four people and started cooking. I stifled a laugh but suggested to him that he might consider using a bigger pot”. It’s a moment that will stay with me forever. As life goes on, members of the older generation leave us and new family is born. It’s hard to get everyone together around the table these days. This past weekend we decided to have the family over for sauce. My wife took my son out shopping and I had the kitchen to myself. I turned on some music and cooked away in my white t-shirt that definitely had splatters of sauce on it. It made me happy to think that I come from such an amazing group of people. Both of my grandfathers are long gone, but in the best parts of me, I see them. I also see them in my son, who I will teach to make a sauce as soon as he can reach the stove. ← Cookies don’t come from tubes! Aw. I’m glad she read it. When I think of the amount of time that Nate spends at your house, I remember how exited I was to always visit my grandparents. “Like” is a serious understatement, great post Tom. This was great Tom. I actually got choked up reading it.